DTC Technologies Pvt Ltd, which owns and operates a platform for physical storage services or warehousing for consumers under the brand name BoxMySpace, has raised Rs 1.92 crore ($300,000) led by Farooq Oomerbhoy, one of the co-founders of early-stage investment firm Orios Venture Partners, the company said on Tuesday. Ritesh Veera and members of Singapore Angel Networks also participated in the funding round. 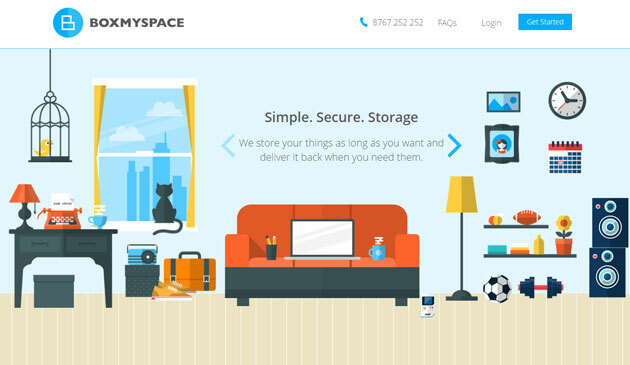 Established in January 2015 by Pratyush Jalan, BoxMySpace seeks to bring the convenience of cloud storage to the physical goods of a consumer's home. The consumer can avail on-demand storage service for his/her household goods at their doorstep either through the web or mobile application across Android and iOS platforms for a monthly fee starting Rs 99. BoxMySpace doesn't own the warehousing space itself but leverages the unused spaces in large warehouses and plugs the gap to provide a technology backed solution to retail customers. It also provides the consumer with their storage dashboard to create a visual catalogue of all their stored items and a code to each item/box to enable recall within 12 to 24 hours. It is currently offering its services in Mumbai and the company will use the funding primarily for expanding operations in other metro including Pune, Bangalore and Delhi besides marketing efforts. The company also plans to partner with online retailers and SMEs for their warehousing needs. "Given the vast potential and dearth of storage options especially in metros, we were surprised that such service was not currently available. Within a very short span of time, we have received a very encouraging response from our customers giving impetus for growth," said Jalan. Jalan, who did his graduation from Cornell University, New York, was working with WebEngage as a lead engineer before founding this venture. He has also worked with the companies like Microsoft and Qualcomm, previously. "Certain problems plague consumers but do not consciously warrant attention unless a solution is bought forward for them and BmS is one of them. Once consumers realise storage is no longer a hassle and expensive, BmS will become their preferred choice. We are working closely with BmS to introduce this solution to not only Indian consumer, but given the scalable nature of the business will be looking to expand in other part of Asia very soon," said Oomerbhoy. Some US-based peer group ventures MakeSpace and BoxBee have raised $10 million and $7 million in VC funding, respectively. BoxFul in Hong Kong also recently closed a $8 million funding round.